That’s one of the most important lines spoken by one of the characters during a pivotal scene in Christopher Nolan’s sequel to Batman Begins. The Dark Knight is not an easy film. It is, by all means, an extremely enjoyable and spectacular one, but it will work you for its brilliance. Because of that one line. Following from its predecessor, this sequel takes the theme of fear that was so dominant in Begins and twists it into something far more terrifying. What can you do against a person who has no fear? Has no boundaries? No sense of personal danger? The introduction of the Joker into Nolan’s Bat-verse is the perfect foil as the purple garbed villain enters Gotham city’s streets and turns everything upside down and inside out, with only one desire – to show that beneath everyone, no matter how noble, lays a monster. And in doing that he stretches Batman’s moral compass, made all the more difficult with the arrival of Ace Attorney (ahem) Harvey Dent, who’s the shining new beacon of hope for a Gotham creeping under the influence of crime and corruption in both its civilian society and the law. The film expertly plays off these elements, muddying its waters with complex ambiguity at every turn, leaving no character safe in its pursuit of what is ‘just’ and ‘right’; amorphous concepts that constantly come under the script’s microscope. People ask if Batman has harmed the city more than helped it, through the rise of vigilantism and people like the Joker. Or if Dent’s dogged persistence and belief in the judicial system is realistic when over half the police force is involved in crime itself. And each time the main characters ask themselves if doing what is right worth their convictions, the answers refuse to come easily, made harder through the reflection each one sees in the other – Batman believes in going outside the law to get things done, Bruce Wayne is less certain, especially in seeing the courage of Dent, who himself has shades of Batman’s lawlessness within him. 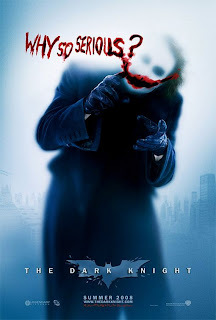 Rachel Dawes, the one who they both hold their affections for, falls between those gaps, while the Joker shines an unpleasant light on all of them to expose the hypocrisy and contradictions in their lives. The film doesn’t try to answer all the questions it poses – that would defeat the point of them, in some ways – but it does leave you pondering, never letting you settle too comfortably in jumping off the fence before exploding in an incredible action sequence or an emotionally charged or deeply unsettling scene. Naturally, it’s the latter of those that the late Heath Ledger’s Joker really stands out. A lot has been said about Ledger’s performance, given it was his last full one before the unfortunate events that took his life. Posthumous Oscar material or not, there’s no denying that his Joker is simply amazing. To say he disappears into the role would be an understatement – there’s no trace of Ledger in the character he plays on-screen. He IS the Joker. Each appearance is marked by such a feeling of charisma and dread that you’re transfixed. Not to say the other cast members suffer from this – all are well played, Aaron Eckhart’s Dent especially, who provides the core of the story and so had to be good – it’s just that the Joke- erm, I mean, Ledger, commands his scenes with such force it’s hard not to feel in awe. While Jack Nicholson may have claimed fans everywhere in his turn during the Tim Burton 90s Batman movie, Ledger’s iteration makes even Nicholson’s cower in despair. There’s mirth to him, true, but it’s layered with a calculatingly sinister streak that’s frightening to watch, yet impossible to turn away from. And while Nicholson’s Joker is fantastic, the 2008 edition has you gripped at every turn because when he’s around horrible, horrible things happen, regardless of whether you’re convinced a character is safe or not. Hell, when you see how the Joker introduces himself with his magic trick, you’ll never turn back. 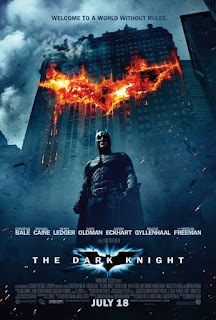 Is The Dark Knight a masterpiece? At this stage it’s hard to honestly say. Not without a few more (very eager) viewings and the test of time. It won’t change your life, nor is it perfect – some very, very minor moments in the script undermine its tone and on a couple occasions the editing is a little haphazard… but it’s really nitpicking to ever suggest these actually harm the film. It’s certainly the best movie I’ve seen all year and without a doubt the best comic book adaptation created. Which is high praise coming off the incredible likes of A History of Violence, Iron Man, Spider-Man 2, X2, Road to Perdition, Sin City, Batman Begins and a host of other greats. At the moment, after a breathless exit from the cinema and a few hours of contemplation, they don’t even come close. Some have suggested this is because Nolan’s film is a very strong crime thriller wrapped in the spandex of superhero form. That effectively Batman, Joker and crew have stumbled into a noir classic by accident. I disagree. Remove these characters and replace them with a stock crime movie cast and part of what makes The Dark Knight so special goes missing. 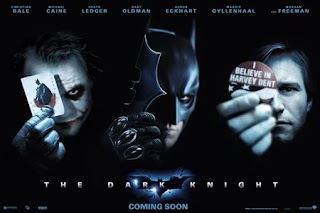 Nolan has gone through great pains to show the characters’ evolution from Begins, making their choices a natural progression from the first film, but also underlining their core traits that have made them so popular in the first place. The moral dilemmas on show work in tandem with the costumes and gadgets and high octane action sequences, given a modicum of suspension of disbelief because it’s Batman. We’re just so sapped into the tale that we forget. Yes, it’s a crime story, but it’s also a Batman story – and you remove one from the narrative, the whole wouldn’t be nearly as strong. 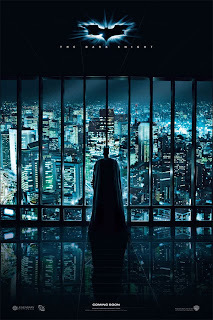 Everything here is given purpose and reason, making it one of the most tightly plotted films in recent mainstream cinema – and the Batman mythos and its well known concept is an important part of the whole instrument. Saying The Dark Knight works without it is a bit like saying a guitar will still ‘work’ if you cut a couple of its strings. You’d be right, but it kinda misses the point. 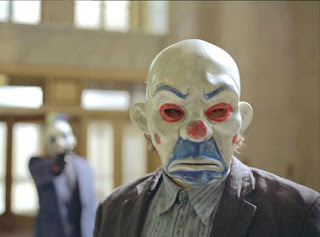 Chances are The Dark Knight, as sterling as it is, will leave you exiting the cinema a bit conflicted. Exhausted. Maybe even a little dirty as it thoroughly bathes you in murky moral greys that refuse to wash white come the film’s heavy climax. This is not a leisurely experience. It will ask questions of your morality and challenge you… and for some it may be too much. Too close to the knuckle. Too punishing. Too harsh. And there, in that moment, comes the answer. That, is the price of masterful cinema. just back from holiday tonight.Went to see the Dark Knight with the family not really expecting to enjoy it but I thought it was excellent.I couldn't believe we had been watching it for 21/2 hours.Glad your keeping yourself busy.Catch up with you tomorrow.